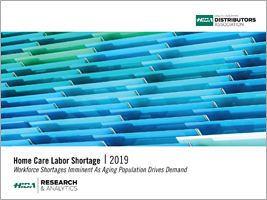 **PDF Download** As the U.S. population ages, significant workforce shortages are expected in home health care. HIDA’s 2019 chartbook examines trends in the home care labor market and future projections for workers within this important segment of the healthcare industry. The 2018 Home Care Market Report looks at the growing market for home care services, and analyzes the effect of reimbursement trends on industry performance.